This data differs from 10.1, which shows students lacking 5+ A*-C GCSEs, while this map is based on data for students lacking A*-C on Maths and English GCSEs. For the school year 2015/16, the difference between the proportion of disadvantaged pupils and the proportion all other pupils attaining an A* – C in maths and English GCSE at 16 (the attainment gap) in Inner London is almost half (16 percentage points) of the attainment gap in the rest of England (30 percentage points). Outer London has a larger attainment gap than Inner London (23 percentage points) but is still significantly smaller than the rest of England. The shrinking of the attainment gap in London is a key factor in the ‘London effect’ whereby London pupils outperform their counterparts in the rest of England. The size of a borough’s attainment gap is generally driven by poor attainment by disadvantaged pupils rather than high attainment by non-disadvantaged pupils. 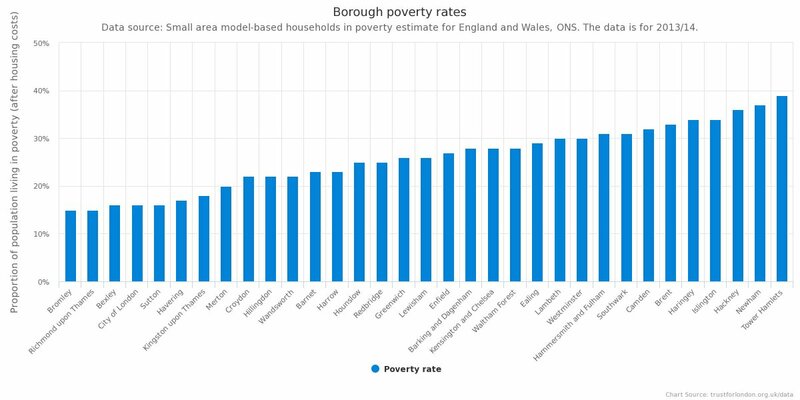 * Most of the boroughs with the biggest attainment gaps between disadvantaged pupils and other pupils are also among the worst boroughs for attainment of disadvantaged pupils. Havering and Bexley have the worst level of attainment of disadvantaged pupils of any London boroughs (57% and 55% of disadvantaged pupils in the borough didn’t attain A* – C in maths and English GCSE at 16 respectively) and are tied for the fifth biggest attainment gap (28 percentage points). The largest attainment gap was in Richmond (31 percentage points), which had the fifth worst attainment for disadvantaged pupils in London (53% not attaining). While the gap is usually driven by poor attainment of disadvantaged pupils, there are some exceptions. Tower Hamlets has the lowest attainment gap (7 percentage points), both because it has one of the best attainment rates for disadvantaged pupils (39% not attaining), but also because non-disadvantaged pupils have the fourth worst attainment of any borough (32% not attaining). Hackney has an attainment gap twice as large (18 percentage points) as Tower Hamlets, despite having a similar attainment rate for disadvantaged pupils, because non-disadvantaged pupils have the fifth best attainment in London (only 21% not attaining). 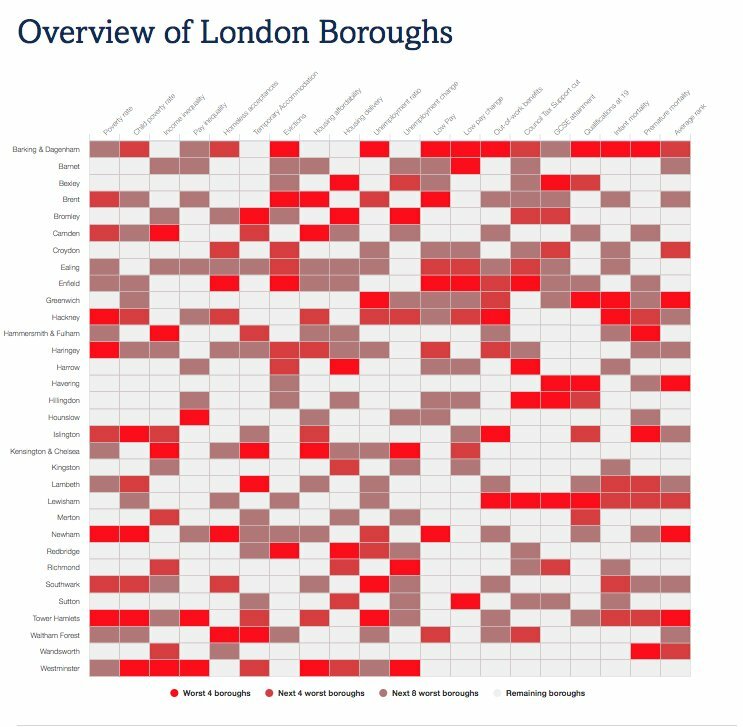 Hounslow has a smaller attainment gap to neighbouring boroughs, both because disadvantaged pupils do comparatively well (43% not attaining) and nondisadvantaged pupils do comparatively badly (30% not attaining). * In 2015, this indicator used pupils eligible for Free School Meal (FSM) as a proxy for poverty. Department for Education has included ‘Disadvantage’ as a category this year, which includes pupils that have been eligible for Free Schools Meals at any point in the last six years (about half of the pupils in this measure are currently eligible for FSM), and pupils who have been or are in care. This category has been adopted instead of FSM for this indicator, as it captures children whose families are no longer receiving out-of-work benefits but are likely to still be living on a low income. This data differs from 10.1 above. 10.1 shows students lacking five+ A* – C GCSEs, while this map is based on data for students lacking A* – C in maths and English GCSEs.